Don't go fishing... GO CATCHING! As of April 4th, 2018 Salmon fishing on the Columbia River has been decent the last week. Columbia River is set to close Saturday, April 7th. With the Columbia River closing, we are moving our efforts to the Willamette River. 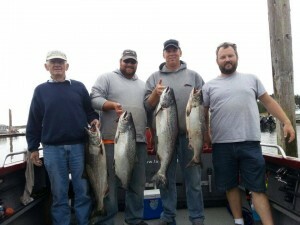 There already has been plenty of Salmon caught on the Willamette River. April and May will continue to be good Salmon fishing on the Willamette River. April and the first part of May I will be fishing on the lower part of the Willamette River. Then we will move up the River to the Oregon city area. Call us today to get one of the best-eating fish that the Pacific Northwest has to offer Spring Chinook Salmon.